The Ozone Connect Pro harness is the best snowkite harness on the market. Comfortable back and leg straps fit comfortably over winter clothing with a one-size-fits-all design and the stainless steel spreader bar makes hooking and unhooking a breeze. It's also a fantastic harness for landboarding or buggying. 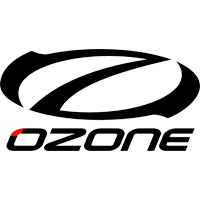 The Ozone Connect Pro harness is ideal for all snow or land kiters with the added support and ease of use of a Stainless Steel spreader bar. This comfortable waist harness includes removable leg straps making it a very universal harness on the snow or land. 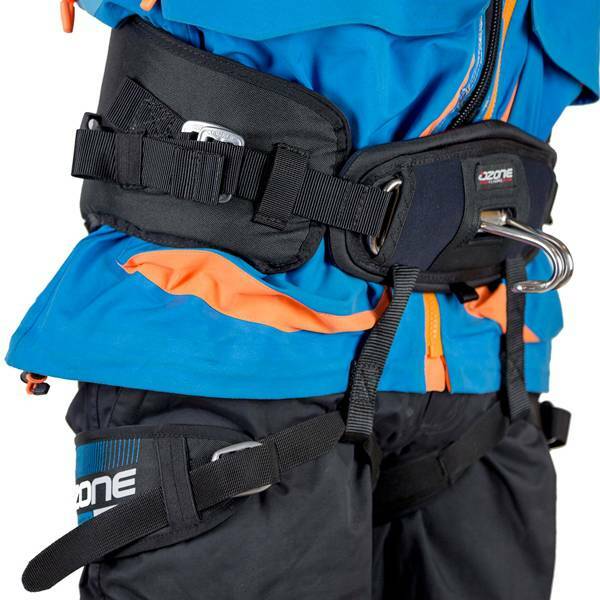 Designed for comfort, support and flexibility in use, this harness is perfect to wear over or under your snow gear. Featuring high quality Aluminium adjustment buckles on the spreader bar and leg straps. 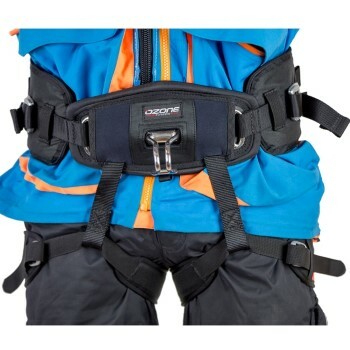 The Connect Pro has been designed like a rock climbing harness so that it will not ride up. Spreader bar - The Stainless Steel spreader bar attaches directly to both the harness and the leg straps reducing spreader bar upward tilt. Extra padding and neoprene covered for comfort. Aluminium buckles - High quality extra strong aluminium adjustment buckles are easy to open and close. This makes fitting on the harness very easy even under snow gear. Smooth adjustment reduces wear on webbing. 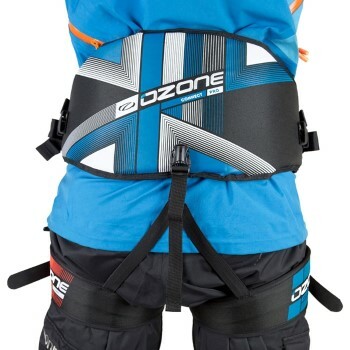 Strong internal structure - Plastic layers along the back section with full length webbing support for ideal load distribution and extra strength. Removable leg support straps - Color coded, thin and light yet comfortable leg straps with neoprene lining for a strong grip/hold on winter clothing. The leg straps are connected at an ergonomic angle distributing vertical loads between the attachment point and leg padding. They can be easily removed or fitted under your snow pants without having to take them off. Ergonomic shaping - Increased support through wider and improved ergonomic shaped panelling. The load is distributed evenly over a larger area. Comfort grip fit - Extra padded areas for increased comfort and neoprene lining for a strong grip/hold on winter clothing. It also protects better against the cold. Technical backpack connection - Female buckles on each side connect directly with Frenzy and Summit technical backpacks. Simply unclip the waist strap from the backpack, remove it and click the bag straps into the harness. Kite leash attachment - Easy to access front kite leash attachment. Webbing loop attachments - Attach a grab handle or ropes for pulling sledges to the webbing loops on each side of the harness. One size fits all - Fully adjustable to fit all shapes and sizes, both under or over clothing and outer winter layers. Under separate cover I will send a Microsoft Word document with some image captures. Can't ask for a better harness for snowkiting. Fits over the bulky winter clothes and is very comfortable, though can sometimes be a bit of a balancing act trying to get your ski boots through the leg loops while standing. Really confortable and solid! Top of harness (waist part) turn around body easily! Enjoy my purchase! Free Shipping on orders over $99. See our shipping page for more details. Subscribe to the best kiteboarding newsletter in the industry, its full of weekly deals.